Ti West is one of the most influential and highly regarded directors working in genre film. While he made his name working on horror films (HOUSE OF THE DEVIL, THE INNKEEPERS and THE SACRAMENT) those of us following his career knew he would eventually move into other genres or more mainstream fare. He was just too damn good not to cross-over. After finishing his last film West wanted to "do something different... to make a movie that was a real celebration of cinema." Is there anything more cinematic than a western? 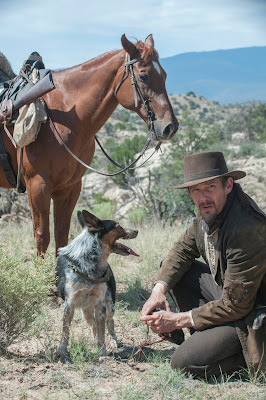 At the same time producer Jason Bloom and actor, Ethan Hawke (Paul) were looking to do an action western together. They saw this as an opportunity to finish out an unofficial trilogy of action films. SINISTER was their "action thriller" film, THE PURGE was their "action horror" film and Ti West pitched them what would become IN A VALLEY OF VIOLENCE, their "action western." I personally never saw SINISTER as an action film and THE PURGE was more of a thriller in my estimation... however they want to frame it, the results have been pretty damn satisfying thus far, so they can call it whatever they want. IN A VALLEY OF VIOLENCE is a classic western story, in that it follows a mysterious drifter making his way to Mexico accompanied by his dog. The pair attempt to shorten the trip by navigating through a large valley. A small forgotten town rests at the bottom named Denton - but its citizens have taken to calling it the "Valley of Violence." The people of Denton are controlled by small group of thugs who rule with intimidation and savagery. Hawke plays Paul with a detached sense of cool that is downright hilarious at times and Travolta (The Marshall) gives one of the best performances of his post-PULP FICTION career. While we are on the subject of performance Larry Fessenden (Roy) absolutely crushes it here. He is one of those actors who has been a secret weapon for smart directors for the better part of 20 years now. 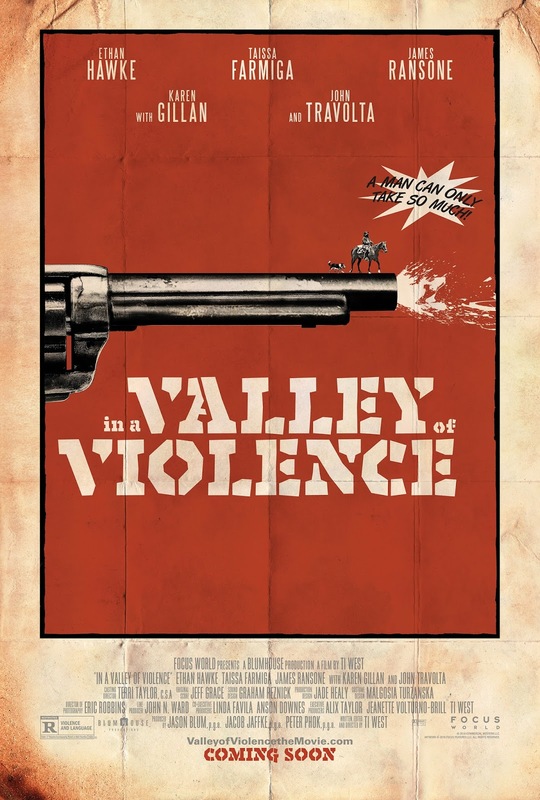 IN A VALLEY OF VIOLENCE is a rare film that effectively combines action, comedy, and tension. Those who saw THE INNKEEPERS know that West can pull off horror/comedy but a western hybrid is an entirely different beast. Come to think of it, one of the only western mash-ups like this to really work for me was Perter Fonda's THE HIRED HAND, and that film is 45 years old. To say films like this don't come along very often is an understatement and I can see why. I watched IN A VALLEY OF VIOLENCE with my wife and it really didn't work for her. She loves Westerns but wants them to keep their feet firmly planted in their dusty roots. No deconstruction or commentary, thank you very much. If you are the type of viewer who thinks tropes are meant to be skewered, reinvented and examined in the light this very well could be the film for you.